The rumors have been confirmed – the Godfather of Heavy Metal is embarking upon his last ever tour in 2019!! 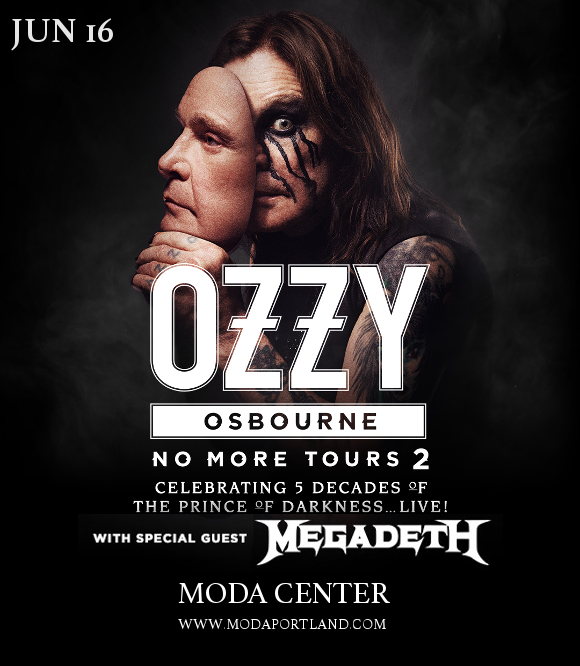 The No More Tours 2 tour is really going to mark the end of the careers of one of rock and metal’s greatest artists in living history – these concerts are guaranteed to be iconic! It’s all happening at the Moda Center on Tuesday 16th July 2019 – make sure you’re there!! Tickets in high demand and expected to sell out FAST – get your hands on tickets this minute, before they disappear!! Gaining notoriety as the frontman of Black Sabbath, Ozzy Osbourne is widely regarded as having pioneered the heavy metal genre with the band in the 70s. Much loved for his iconic image, crazy onstage antics and highly distinctive piercing voice, Ozzy Osbourne is widely known as the Godfather of Heavy Metal. After his departure from Black Sabbath, in addition to appearing in several television series with his family and co-founding the international touring heavy metal festival Ozzfest, Ozzy Osbourne has had a long and successful career as a solo artist. Get ready to witness the last tour of one of the greatest legends in heavy metal music – have you got your tickets yet?? ?